Burn the Rope! Yea! Burn it! With perhaps a play on words with the similarly named app, Cut the Rope, Big Blue Bubble’s new physics based strategy puzzle game lets you set fire to ropes trying to burn every inch of them and sometimes even torching up little insects. If you’ve ever tried to start a fire in the wilderness you know how hard it can be to not only start a fire without the proper tools, but how much effort it takes to keep the fire going. Thankfully in Burn the Rope, you don’t need matches or a lighter to start the fire. You just tap the rope and it catches fire instantly. Now the trouble is keeping the flame going. The fire burns what’s on top of it so that’s where your physics controls come in handy. As the rope burns you rotate the iPhone so that the flame keeps going upwards and burns off the entire rope. Burn the Rope has a fun little theme song and a playful fire character that introduce you to the game. 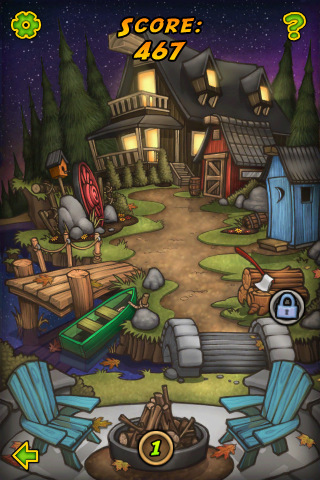 There are 5 stages with 16 levels in each stage for a total of 80 levels in the game. You start out in the Firepit stage and work your way unlocking the next levels. After you burn 60% of the rope you get a bronze medal, and you can move to the next level. Get a silver medal for 80% completion and gold for burning up the entire thing. As you progress through the levels, you’ll encounter bugs crawling along the rope. Different bugs have different reactions to the flame. For example, the ant changes the color of the flame so you can burn different colored ropes, and the spider shoots out a web bridge so you can access parts of the level that you could not before. Each level has a new type of rope layout that you have to conquer. Ropes are laid out in simple shapes like circle, and square, then onto very complex shapes like ladders, and ice cream cones. You can start the fire anywhere you want on the shape. After you touch the rope it burns going away from the starting point in both directions. You can then try to keep both fires going if you can or at least one to avoid losing the level. As your fire gets close to corners you have to rotate your iPhone in time to keep the flame alive going upwards. Corners are tricky in this game. Most are pretty sharp, and if you don’t time your rotation just right, your fire goes out. 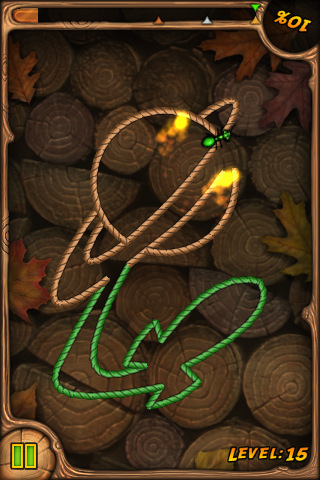 As your flame gets close to other ropes, you have the possibility of doubling or tripling your flame if you can try and catch the other parts of the rope on fire. The fire physics in the game are excellent. Gameplay is fun at first then becomes a bit tedious as the levels go from being super simple to extremely difficult instantly. Perhaps a more gradual shift in difficulty would help users get into the game. Nevertheless, Burn the Rope has strong replay value and offers a novel and elegant gameplay style using flames. A delightful little time killing puzzler perfect for burning up your excess free time. AppSafari review of Burn the Rope was written by Joe Seifi on December 29th, 2010 and categorized under App Store, Featured, Fun, Games, Physics Based, Puzzler, Strategy. Page viewed 4272 times, 1 so far today. Need help on using these apps? Please read the Help Page.